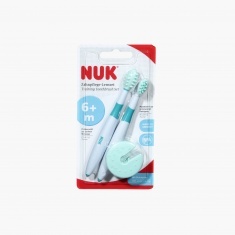 Your little one will efficiently learn to keep his teeth clean and hygienic using this training toothbrush set. It comes with a cleaning trainer, brushing trainer and protective ring. Feature 2 : 2 x different toothbrushes a cleaning trainer and a brushing trainer.